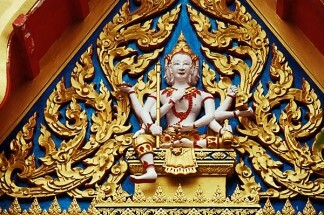 Thailand offers a variety of experiences to suit every traveler. From tropical seas to the south to the modern capital of Bangkok, from the ancient ruins north to the dense jungles of neighboring countries, Thailand is known for its diversity. Take an afternoon river cruise down the Chao Praya River in Bangkok. Learn about the ancient culture of Thailand at a dinner cultural show at the Siam Nirmit. Cycle through Central Thailand and explore rural Thailand. See Elephant Polo in Hua Hin. Participate in the Buddhist Ghost Festival on the border of Laos in Dan Sai. Cruise from the northern Thai border into Laos and see two countries at once! Possiblities on ways to discover Thailand are endless. Explore a side of Thailand that few tourists see on this cycling trip through Central and Northern Thailand. Bike through rural country roads and mountain trails to see fruit orchards, teak plantations, mountain streams and secluded villages and discover Thailand’s scenic beauty and legendary hospitality along the way.